Cylinder Rod Ends GK.DO Series have the function to connect the rod of the cylinders to the parts of the machine that must be handled. 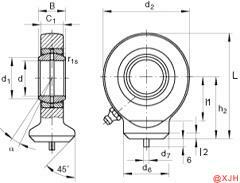 We are a professional manufacturer for rod end/rod ends bearing/ball joint, hydraulic rod ends and spherical plain bearing with years of experiences. Our products are widely used typically in such industries as textile dyeing machinery, packing, printing, power transmission and medical equipment. They are suitable for rotary, oscillating and linear movements and are lightweight. The construction of these accessories is nickel-plated steel and are available in stainless steel. We specialize in Cylinder Rod Ends GK.DO Series only, our goal is let all customers get their satisfying products. Available in various specifications these can also be custom made as per the clients requirements.